Our organization has gained the leading position by manufacturing and supplying the best range of Automatic Powder Coating Plant. Our Automatic powder coating plant is used for powder coating of components to give them the desired quality finish. Sturdy construction, Excellent performance & Long service life. The MRS System is a robust, versatile and expandable concept. Multiple options and versions enable the utilization of the system for a variety of single color and multi color applications. Efficient and flexibleIn single color lines the MRS excels for its top-efficiency and optimal powder usage thanks to the exceptional efficiency of the filters.In the multi-color version the MRS is equipped with a compact multi-cyclone unit which stands out for versatility and simplicity of use. Compact and gentle powder recoveryThe recovery system is integrated in the booth walls. 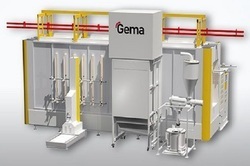 This very compact solution optimizes the powder usage, avoids contamination in the ambient and prevents the deterioration of the powder quality in the recovery circuit. Robust and user-friendlyThe simple and robust design, the long life-time of the filters and other components, makes the MRS the ideal solution, if you are looking for a reliable system with reduced maintenance costs.